L: 79" x W: 38" x H: 38"
Cameron Sofa Indulge your love affair with mid-century design with the Cameron sofa. Sporting crisp, tight tailoring, menswear-inspired fabric with subtle button tufting, decorative piping and flared peg legs, it's retro-chic styling at its very best. Plus, this sofa includes 2 matching throw pillows. Indulge your love affair with mid-century design with the Cameron sofa. Sporting crisp, tight tailoring, menswear-inspired fabric with subtle button tufting, decorative piping and flared peg legs, it's retro-chic styling at its very best. Plus, this sofa includes 2 matching throw pillows. I love the firmness of this sofa. The fabric is lovely and soft and the look is clean and fresh. It invites you to lay down and kick off your shoes! I loved it so much, I bought the love seat to keep it company. 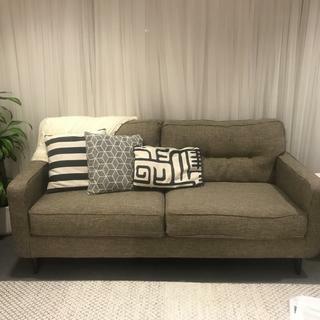 I like this couch in terms of look and comfort (definitely on the firmer side) and the fact that it's a good size for an apartment but it arrived with a very strong smell which I assumed would go away in a few days. It's been 1.5 weeks and the smell is still there, although not quite as strong. The main problem is that my eyes start to burn if I sit on the couch for too long. I've never been sensitive to a smell or fabric before. I'm concerned something it's made with is giving off fumes and may not be safe. Purchased this sofa for my daughters studio apartment. The profile is perfect...roomy couch but not overwhelming and so so comfortable! This couch looks and feels great. It’s perfect for a small stylish home. Not suitable for average height overnight guests, but three average sized people can comfortably sit and watch tv together. Super great quality for a great price! Love the tweed look with the mid century modern legs. Does shed slightly on clothing. Not only is this couch and matching loveseat jute, which is a natural and somewhat exotic material, but it looks great. I am very happy and impressed with Raymour & Flanigan, and with their service and on-time delivery exactly as promised. Just firm enough and love the tweed fabric. Very happy with my purchase. Great quality and great price. Ties my living room together perfectly. Very comfortable, firm seating. Getting complements from everyone who sees it. Jute gives relaxed feeling in a formal room. I am so glad I made this purchase. The color is great and it's so comfy. It's bigger then it appears, but it's not huge; a decent size to have someone sleep on it so that's a plus. It's sleek and more modern looking so that's why I chose it and I am extremely happy with it. Too bad there are more pieces like this one so I can have a complete set! This couch is fits my style so well - it is firm in the seat, but has a soft and comfortable back. It looks really great in the house and has upgraded my living room. Great couch and really comfortable - I would recommend this this furniture piece to people as it’s a great value for the money. Well where do I start? The sofa came with a broken leg and some stains that look like they tried to remove on the cushions. I can go on but I will wait for someone in customer service to get back to me. 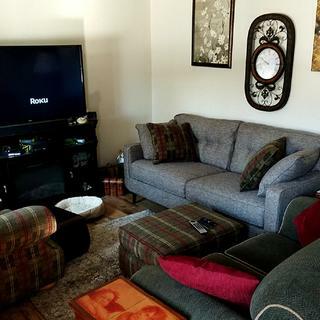 is this a click clack / sleeper sofa? BEST ANSWER: No, this is not the click-clack model or sleeper sofa. However, it's a beautiful piece. It's long enough to take a nap on and incredibly comfortable. I'm actually ordering the same sofa again! Comes in one piece. The only removable pieces are the two seat cushions, which are held in place by a velcro strip. This is not a sleeper or click clack sofa. It is a basic sofa without any pull out. it is not a sleeper sofa, but the seat is deep enough to sleep on if needed. No...just a normal couch with removable cushions. What color is jute consider to be? Are all the cushions removable or are they attached? BEST ANSWER: Thanks for your answer, Steven. That is correct the seat cushions are removable (but not reversible) and the back cushions are attached. The seat cushions are removable, but the back cushions are attached. What is the directional depth (DD) measurement of this sofa? And how long are the legs if they are removable? BEST ANSWER: Hello Lauren, thank you for your interest in the Cameron Sofa! We recommend a 32" door width. The removable legs are 6" in height. Is this available in store? BEST ANSWER: Yes. The legs are removable.